T wo St. Peter’s Square is a new build, Grade A office space in the heart of Manchester city centre, consisting of 12-storeys above ground and two basement levels. The key driver for the structural design was to provide highly flexible column-free accommodation that would be attractive to potential tenants. The typical beams are 730mm deep and, over the 18m span, vibration was a key criterion governing many of the section sizes. At ground floor level the architectural intent was to provide a colonnade with columns at 12m centres and cantilevers of 6m at either end. Continuing this wide spaced gird on the typical floors above was not economic and a number of options were considered. Considering the buildability and cost implications a transfer structure at the lowest level was the chosen option. This greatly simplified the buildability and allowed a considerable service zone, which was required to support the servicing strategy. 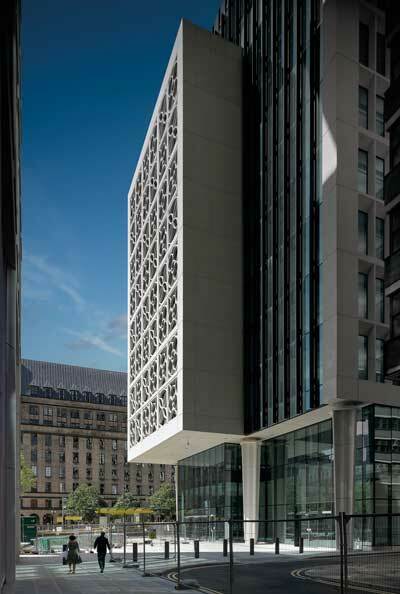 Client: Mosley Street Ventures LtdTo maximise the spatial experience of the colonnade at ground floor level the columns are double-height, with the first floor set-back from the perimeter. Long-span transfer beams at level two achieve this with the first floor hung from above. A similar arrangement is adopted at level ten with transfer beams that support the set-back columns above. This arrangement provides a high value terrace space overlooking the civic heart of Manchester. Supporting the façade presented a number of engineering challenges. Each unit was constructed in 6m wide by 4m high mega-panels which were supported vertically at the base and tied laterally at the head. Mega-panels are supported by stubs directly back to each steel column, allowing a slender perimeter edge beam, coordinating well with the fenestration.